Carlotta Outley Brown is a proud product of HISD schools where she was a proud graduate of James Madison High School in 1979. Later she matriculated on to college where she graduated from Houston Baptist University earning a dual degree in Elementary Education and History. Principal Brown is a 31-year educator. She has been a part of the HISD family since 1991. She began her career as a 4th grade teacher in Fort Bend Independent School District at Briargate Elementary School. The very next year she was hired as a 1st grade teacher at Burnet Elementary. At Burnet, she was promoted to Instructional Coordinator in 3 years. Soon afterward, she was promoted to Title I Coordinator at Jaime Davila Elementary School and then on to become the Assistant Principal of Davila Elementary School. It was just a 2 months later that she was named Interim Principal of Davila for 10 months then she left to become Dean of Students at Deady Middle School. In July of 2005, Principal Brown was named Principal of Lora B. Peck Elementary where she has been until now. Mrs. Brown has earned numerous awards under her leadership as the principal. Peck was named a 2008 National Blue Ribbon School by the U.S. Department of Education. In addition, she is a Terrel Bell Award Recipient for being 1 of 5 of the best outstanding principals in the United States for her leadership in turning around a school. Also, Principal Brown and her school along with HISD’s homeless department has been featured on the Ellen DeGeneres Show in which Ms. DeGeneres generously awarded the school $100,000.00 and personally gave Principal Brown $10,000.00. Principal Brown used those monies to purchase laptop carts and I-pads for the classes. Principal Brown continues to keep in touch with Ms. DeGeneres. Presently Principal Brown is a finalist for the “Life Changer of the Year Award”. Carlotta Brown feels so blessed by all her accomplishments and her forging the way to help and bless others especially making a difference in a child’s life. Her mantra is: “To Much is given, much is required!” Now, Principal Brown has fulfilled a lifelong dream. 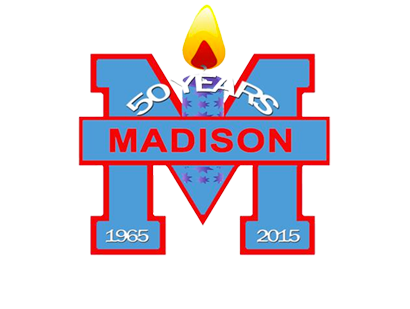 She has been named the principal of her alma mater, James Madison High School, home of the mighty marlins where she will be so very proud to lead and take it to the next level. 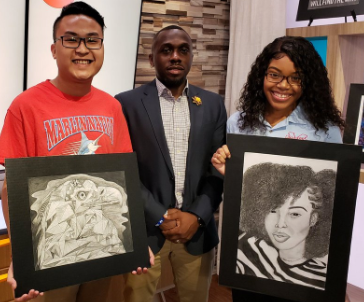 This week, we’re showcasing art from students in Mr. Damien P. Wyre-Hunter’s art class over at Houston ISD’s James Madison High school. Monday- Friday by 2:00 p.m.
Lunes - Viernes antes de las 2:00 pm.